Room Mate Hire. UK Delivery. £25 Per Week. Enter your details and we'll call you right back. Lightweight, compact and stable this small platform and tower system is ideal for interior decorating and maintenance work. When you carry out low level projects in a building, a full size scaffold tower can block corridors and exits for other workers and users. Also if a tower is too big to roll through a doorway then this mean dissembling the scaffold towers to move on to the new room. This small lightweight scaffold tower has all the safety features of the Boss system but is scaled down to provide a convenient platform for interior work. The room-mate scaffold tower hire can also be extended using more frames and stabilisers to provide a working height of up to 5.5m. Extending the room mate is easy to do with a few extra components that we can supply with the scaffold towers. Whether you are a painting and decorating professional or you simply want to give your lounge a coat of paint, a new interior scaffold tower product will easily help you get the job done in half the time. The new compact lightweight room-mate scaffold tower is a special type of construction which has been designed specifically for internal use although in many cases it can be used outside just as well. It is great for maintenance jobs and low level access work making your tasks safer and easier. It has also been designed with far fewer components than standard scaffold towers. This makes erecting the tower a super-fast operation and on building sites it cuts down on the common problem of component theft. The best bit is that scaffold tower hire is quick, easy and it doesn’t have to be expensive if you go to expert construction suppliers such as Lakeside Hire. It means that you don’t have to spend a lot of money buying equipment for a one-off job. 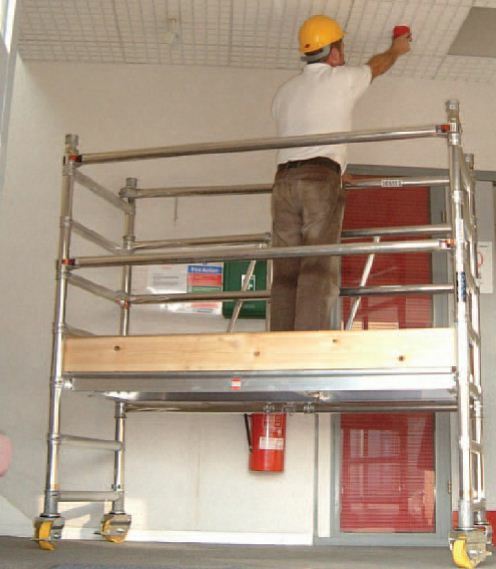 The small, super-light room-mate scaffold tower provides a perfect platform to work from making it ideal for low-level projects inside buildings where a standard scaffold tower often proves to be too big and cumbersome. It has all the safety features of a standard scaffold tower but on a slightly smaller scale so that you can easily manoeuvre it into any position as you work along. You can also extend it with more frames and stabilisers if you need to which means that you have ultimate flexibility without compromising on safety. It is so easy to put together it can be erected in literally seconds because it operates on an ingenious but simple hinge system. 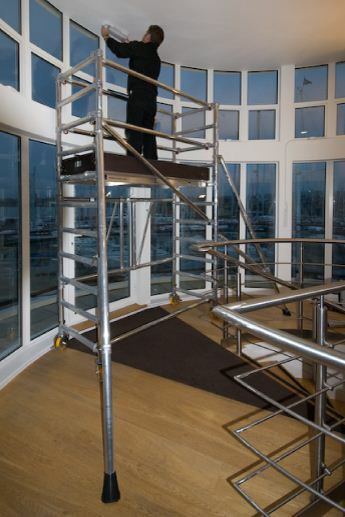 The room-mate scaffold tower is so compact it can even be folded flat, making it easy to transport and it fits through most standard doors giving you total access to your maintenance and decorating work. All prices subject to VAT. Please enter a valid phone number. For example 0201 234 4567. Hire everything from scaffold towers to site boxes, razor decks to podium steps; whatever you need to make your project site as safe and simple as possible. Our amazing prices mean you can hire all the equipment you need for your site to be completely safe and efficient. Call us now, and you could have exactly what you need to get your job started tomorrow. Service rating : great service, only ordered and received 1 set of toe boards although 2 on the delivery note, After collection I was contacted several times asking when I was going to finish my hire. Product : great product did exactly what I wanted it to do,when I wanted it. Fantastic service. Michaela was very accommodating and helpful. Will use again. From ordering delivery and collection a first class service, no complaints.